Step 1. Apply a coat of Art Potch (Matte) to seal the surface of the Giant Popstick. This will improve the tape’s adhesion and prevent pen or marker ink from bleeding into the grain of the wood. Leave to completely dry. Step 2. 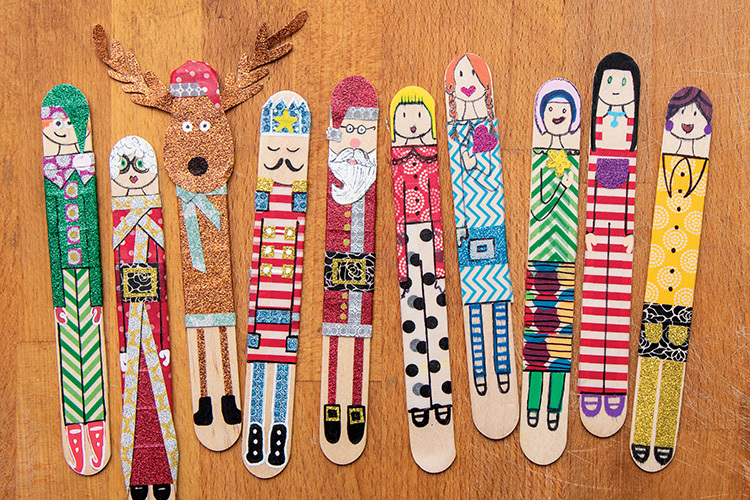 Use strips of washi tape to create the bodies and costumes of your character. Step 3. Outline limbs and clothing with an EverZart Permanent Pen. Draw in the neck and facial features. Step 4. Using Posca Markers, add hair, hands and shoes. Extension: Create a community of festive characters, family members or mystical characters.